Because who has time to turn on the light when you're about to get to the good part. What’s new with the baby? 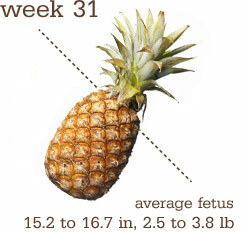 At week 31, baby’s about 15.2 to 16.7 inches long and weighs about 2.5 to 3.8 pounds. She’s also going through major brain, nerve and eye development. Her irises even react to light. All five of her senses are now in working order! Plus, baby’s body temperature is now partially being regulated by parts of her brain. Her bones, with the exception of the skull, are hardening too. 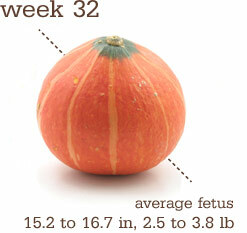 At week 32, your baby weighs in at about 2.5 to 3.8 pounds and measures about 15.2 to 16.7 inches. She’s likely to be in the head-down position now, getting ready for her descent — the journey down the birth canal. And not a minute too soon, because at this point, she’s probably feeling even more cramped inside Mommy. OK…I had a few days there right before Christmas where I wasn’t feeling great at all, but I think I was just overdoing it. Yesterday, on Christmas, I took it kind of easy and I felt fine all day. Except for that part where my normal 8:30am riser woke up at 6:45 or so. 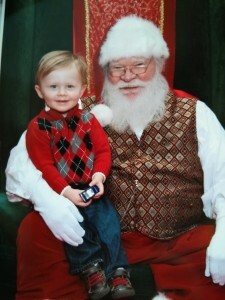 That was unexpected, but today he was back to normal, so maybe he was just excited about all the Santa hype? The baby has been moving around lots and it’s been fun to feel. Up 24 lbs! I checked my posts from last time and at 32 weeks I had gained 20 lbs, so I’m not too far off that mark. And just because I (and everyone else) think I look so big, I’m posting a comparison picture from about the same time, with Urijah. What do you think? Bigger? Smaller? On Par? No face this week, since it’s very tired looking, and also read and splotchy from so much nose-blowing. I actually think I look smaller this time! Could just be the angle or the clothes, but interesting! I feel huge! What do I miss? What am I looking forward to? We have made progress! So, since we were going to paint U’s room (turned out Scott didn’t really like the grey we got and the brown color that was in there already was pretty ok for a boy’s room, we decided to just keep it as is. Scott did put a fresh coat over the top to brighten it up, though), we decided just to bite the bullet and replace the upstairs carpet that was so stained and matted down and, well, just yucky. We got brand new carpet in our room, U’s new room, the hallway and the game room. It is super nice and before it was installed Scott screwed down all the sub floor so there are NO MORE SQUEAKS. It’s really exciting! So, Scott replaced all the baseboards in all of those areas, painted, got rid of the squeaks and then the carpet went in on Monday. Now, the new ceiling fan and blinds will go up in U’s room, and then we can move his crib and toys and stuff over. He already knows that’s going to be his room…he points to it when we walk by and says “Rah-rah”, which is what he calls himself. Then I can make room for all the baby stuff in the nursery again and get things set up and in place. I think the strangest thing will be to put the infant car seat in the car again! CHRISTMAS!! It was a really fun day yesterday. U was over the moon about his toys…so much so that we couldn’t even get him to open everything. He just wanted to play play play. And last night after he went to bed I gathered up a few things and socked them away for a rainy day down the road when we need some fresh entertainment. I got a Kindle Paperwhite!! from Scott and a Le Creuset french oven from the in laws…and a serving bowl from Potterybarn that matches my dishes from my folks. I’m noticing that my taste is getting more and more expensive the older I get. Ha! 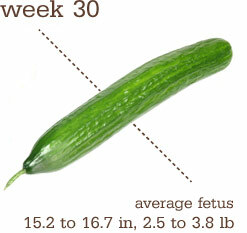 At week 30, baby already measures about 15.2 to 16.7 inches long and weighs about 2.5 to 3.8 pounds. Her skin continues to get smoother while her brain is getting wrinklier — to make way for all that essential brain tissue. One smart baby is forming! And while your little cucumber is not even the size of a five-pound weight, she is strong enough to grasp a finger. MUCH better. I think we are out from under the sickness that would not end! Both U and I were laid up with pinkeye and cold sickness and all that’s left now is some congestion and a little bit of cough. It felt like it took forever for all that to go away, but when you do sickness in waves, I guess it takes longer. Scott was unaffected this time, which is only fair, I guess, since he kept getting sick last year and I escaped it. 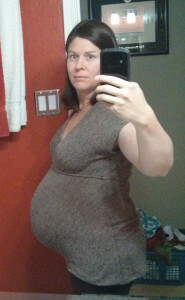 The pregnancy suppressed my immune system so I was an easy target. Still just 20 lbs. Guess I’m going to hang out here for a bit, which is fine with me. So long as the baby is growing! I think with U I gained about 28 lbs total, by the end…we’ll see how this one shakes out. Not really missing anything right now. I’m actually looking forward to taking some tours of preschools next week. Scott will be off work, so he can go with us, too. I’m hoping to find a good fit and get Urijah enrolled after the holidays for a couple of mornings a week. I think we’ll meet with some separation resistance when it comes time for the first days of “school” but once he sees what it’s all about I think he’ll really like it. I hope it will build a bit more independence and improve his language skills…plus just give him some away from home playing time and running around with other kids. Scott is about to be done with work until after Christmas, so he’ll be working on getting U’s big kid room painted on some of these days off. That’s our next step. Don’t have one yet, but I’ll work on it. 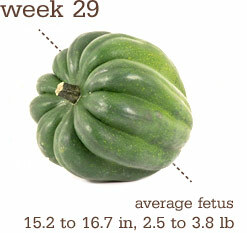 At week 29, baby is getting plumper. Begin to prepare yourself for the absolute cuteness you’ll soon experience every day! Right now, she measures about 15.2 to 16.7 inches long and weighs about 2.5 to 3.8 pounds. She still has a long way to go, and will be tripling her weight before birth! Blah. I’m sick right now. Allergies mostly, I think, but also I seem to have somehow contracted pinkeye. It’s kind of miserable. And combined with the whollop of allergies, I’m sort of a mess. Pregnancy-wise, I’m feeling fine, though. Just exhausted, which is always what happens when I have one of these bouts of allergy misery…and it feels even more concentrated since I’m also pregnant this time. I had my prenatal appt this morning – sort of 2 appts in one, really, since I had to stop in early for a fasting blood draw and then go back in 2 hours later for another blood draw after a ginormous breakfast of and egg, hash browns, toast and jam, a pancake with syrup, sausage and some OJ. We’ll see how I do on the glucose test in a day or two, I think. The regular portion of the appt went well, though. Baby appears to be head-down and facing inwards, and my blood pressure was good and urine checked out OK. We’re already to the time when I start to go in every 2 weeks. Time is flying by! And now with Thanksgiving over and heading into Christmas, it’s just going to go faster and faster. We didn’t weight at this appt since today was the first day of the midwives seeing clients in the new building (which is right next door to the original building) but they didn’t have quite everything moved over yet. So…I was spared the scale this time! (I’ll probably weigh myself tomorrow or the next day…after that massive breakfast wears off, that is!) Update: I’m still at just 20 lbs up from my pre-pregnancy weight. Holding steady for a bit I guess, which is nice since I got to the 20 lb mark quickly! Right now, I just want to feel better. And I’ looking forward to wrapping some Christmas presents! One of the many bummers about family being so spread out at Christmas is that so many Christmas presents are bought online and shipped, so I miss out on getting to wrap them up all nicely. So I’ve got to enjoy the ones I do get to do. Getting U’s picture taken with Santa. That was pretty darn cute. 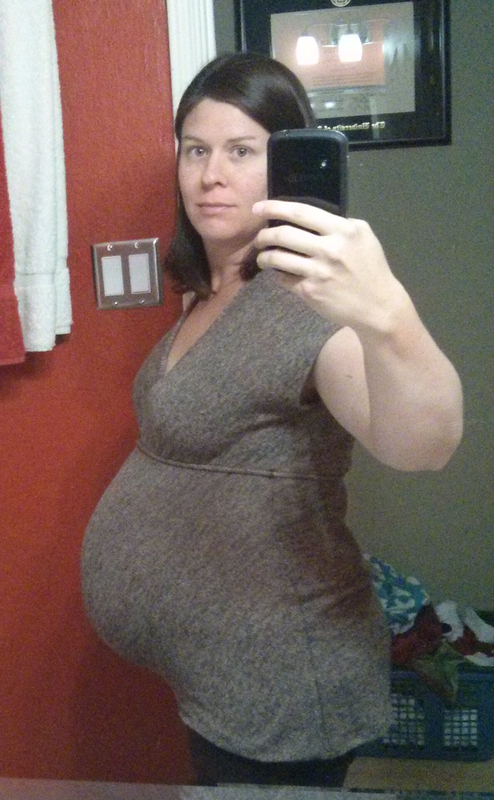 Here’s a candid one from Thanksgiving…technically I was 28 weeks, but it was close enough to the midway point to count for both!